Adapts to almost any surface! The custom engineered InvisiLock Sheet Magnet, a key component to the Visual Magnetics Graphic System, adapts to almost any surface. Not limited to flat surfaces, it can be utilized on columns, fixtures and other dimensional surfaces. Once InvisiLock Sheet Magnet is placed, the intended surface is ready to accept MagnaMedia printed film. InvisiLock® Sheet Magnet is available in both adhesive-backed and double-sided non adhesive versions. For hard panel and fixture applications. This is a peel-and-stick product that has adhesive and release liner applied to the back surface of the sheet. The adhesive will stick to metal, sealed wood, glass, paper, or plastic surfaces that are smooth, hard and free from moisture, oils or other surface contaminants. (ref. -30SE, -30HE,-30SP, -30HP.) Always follow the substrate manufacturer’s recommendation on surface preparation for a rubber-based pressure-sensitive adhesive. 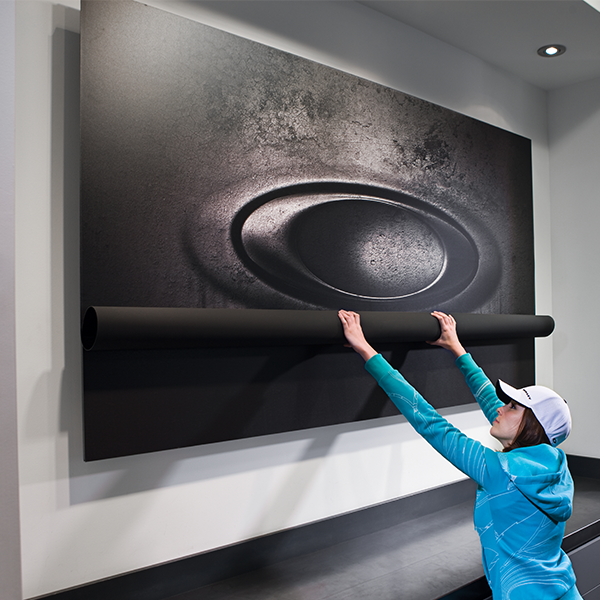 For applying the graphic system to larger wall surfaces (especially drywall/plastered walls). Double-sided InvisiLock is magnetic on both sides of the 40 mil film and is magnetically attracted to a wall that has been painted previously with ActiveWall primer, eliminating the need for adhesives or pastes. We recommend using our high energy InvisiLock Sheet Magnet when applying 3 – 5 layers of MagnaMedia graphics or when fixturing with the magnet. Standard energy InvisiLock Sheet Magnet is plenty sufficient for one or two layers of MagnaMedia graphics.